The broadband bridge: linking ICT with climate action. 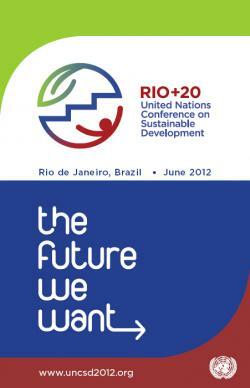 Rio+20 is an alternative name given to the 2012 United Nations Conference on Sustainable Development (UNCSD). Held to mark of the 20th anniversary of the 1992 United Nations Conference on Environment and Development (UNECD or Earth Summit), Rio+20 will take place in Rio de Janeiro (Brazil) on 20-22 June 2012. Rio+20, the 2012 United Nations Conference on Sustainable Development has recognized in its outcome document, entitled “The Future We Want”, the critical role of information and communication technologies (ICT) in accelerating the implementation of sustainable development commitments. The Rio+20 outcome document, agreed by UN Member States, defines the key principles that will guide the international community in the upcoming years to move the sustainable development agenda forward, highlighting the role played by ICTs in facilitating the flow of information between governments and the public, promoting knowledge exchange, technical cooperation and capacity building for all three pillars of sustainable development – economic growth, social inclusion and environmental sustainability. The agreement is the result of multi-stakeholder efforts initiated in 2011 and built on the legacy of the 1992 Earth Summit. The essential role of ICTs and Broadband networks was supported by the United Nations Group on the Information Society (UNGIS), the Ministry of Communications of Brazil and a number of other government, business and civil society partners. Together, they reinforced the message that ICTs are cross-cutting drivers of sustainable development. Press release | Download "The future we want"
The Broadband Commission for Digital Development issued on 23 April 2012 a "Call to Action" to advocate for the recognition of ICTs as catalysts for sustainable development in the outcomes of the Rio+20 conference. ITU together with the Host Country would like to invite all ITU administrations to encourage their national delegations to highlight the role of Information and Communication Technologies (ICTs) as one of the major cross-cutting drivers of sustainable development in the Rio+20 outcome document “The Future we want”.